Secunderabad Bonalu is on 9th July in 2017. Bonalu is celebrated in the month of Ashada Masam (June or July). Bonalu celebrated on Sunday's. In 2017 Bonalu starts on 25th June and ends on 20th July. The dates of Bonalu is June 25, July 2, July 9 and July 16. Bonalu is celebrated on June 25th in Ujjaini Mahankali temple in Secunderabad. Bonalu is an annual festival of Telangana celebrated in Twin Cities Hyderabad, Secunderabad and other parts of Telangana, India. For village Goddess likes Bonam. 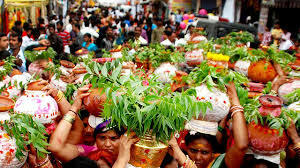 Bonalu Jatara is a Month long Festival. Goddess Shakti is worshiped as Mahakali or Mahankali. Bonam means food, rice cooked in a new pot which offered to Mahankali is called Bonam. Bonalu is a Hindu festival of the Goddess, Mahankali, celebrated in Telangana, India.